Award recognizes top-performing health care organizations performance in Patient Experience. 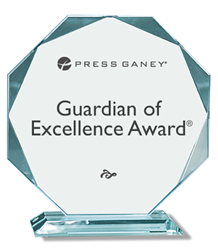 Lourdes Cardiology has been named a 2017 Guardian of Excellence Award® winner by Press Ganey, a leader in patient experience measurement and performance improvement solutions. The Guardian of Excellence Award recognizes top-performing health care organizations that have consistently achieved the 95th percentile or above of performance in Patient Experience. According to Dr. Blaber, the award represents an important recognition from the industry’s leader in measuring, understanding and improving the patient experience. Lourdes is one of the largest providers of cardiac services in the Delaware Valley. Known for its innovation in heart care, the New York Times featured Lourdes as a national model in the effective and swift treatment of heart attacks (https://www.nytimes.com/2015/06/21/health/saving-heart-attack-victims-stat.html?_r=0). Lourdes has received multiple national recognitions for its cardiovascular care, including the Healthgrades 2017 Cardiac Surgery Excellence Award, Truven Health Analytics' 50 Top Cardiovascular Hospitals (2015). It achieved 5 Stars from Healthgrades in 2017 for Valve Surgery as well as Defibrillator Procedures. Lourdes’ cardiac program has also garnered national recognition from Becker's Hospital Review in their 2015 list of 100 Hospitals with Great Heart Programs. Press Ganey is a leading provider of patient experience measurement, performance analytics and strategic advisory solutions for health care organizations across the continuum of care. With more than 30 years of experience, Press Ganey is recognized as a pioneer and thought leader in patient experience measurement and performance improvement solutions. Our mission is to help health care organizations reduce patient and caregiver suffering while improving the safety, quality and experience of care. For more information, visit http://www.pressganey.com.